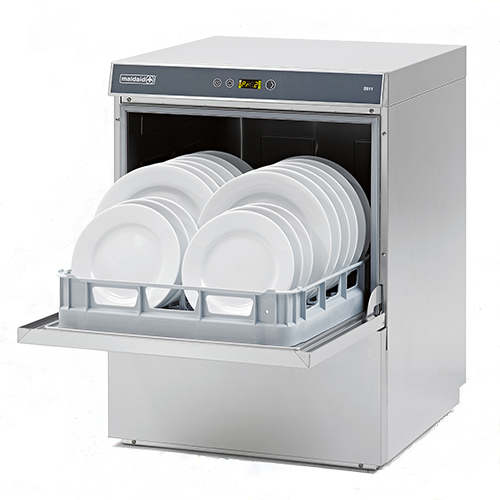 The Maidaid D511 under counter dishwasher with basket/rack size of 500mm x 500mm. Fully double skinned for reduced noise and heat loss. D511 Rack size 500 x 500mm. Moulded wash tank designed for easy cleaning and reduced water usage. Selectable GREEN cycle for minimum energy usage. Full double skinned for noise and reduced heat. One open/cup, one pegged rack and cutlery insert as standard. All Maidaid models come with a 2 year parts and labour warranty as standard. Additional warranty is available. Please call us on 01923 236 238 for details . Terms and Conditions apply.